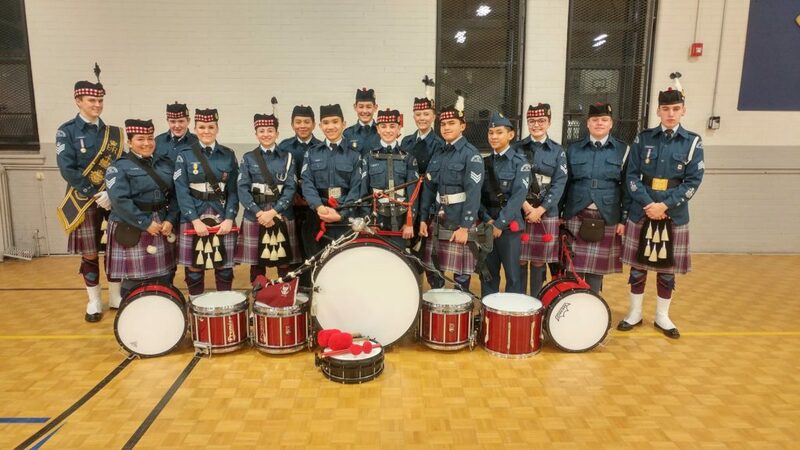 121 Red Arrow Sqn Pipes and Drums Band meets every Thursday from 6:30PM to 9:00PM at William C Winegard Public School : 25 Lee Street Guelph, ON N1E 7E7. If you are interested in learning to play the bagpipes, snare drum, tenor drum or bass drum contact Captain Miller either by email or in person on parade nights. You do not need your own instrument, experience or previous music experience. Our excellent instructors will teach you all you need to know and we will loan you the instruments you need. 121 Red Arrows Squadron Pipes and Drums Band practices on Thursdays from 1830 to 2100 from September to June at William C Winegard Public School : 25 Lee Street Guelph, ON N1E 7E7 and is open to all members of the squadron regardless of musical skill level. Check the calendar as it is updated regularly for any cancellations, changes in timing, special events, competitions or parades. Cadets play a variety of instruments including, bag pipes, snare, tenor and bass drums and are able to progress through the cadet music program, earning music levels as they progress. There is also summer training available through the Cadet Summer Training Program where cadets can go to learn an instrument or to hone their existing skills.